The Slade School of Fine Art has a world famous reputation as a venerable art training institution. I’m currently investigating two early Slade artists who made a lasting contribution to archaeology: Jessie Mothersole and Freda Hansard. I’ve been reading Transnational Slade articles and realised that the experiences of these two women feed into this theme, providing an early example of the School’s international impact, links between different fields of study, and the role of UCL (and the Slade in particular) in providing opportunities for women. As part of my research I’ve examined UCL’s Session Fees books, a rich resource for disciplinary and institutional history at UCL. These books record payments of students’ fees over the course of an academic year (session), extending from October to June, and provide an intriguing snapshot of the student body in each UCL Department at a particular moment in time. UCL admitted both male and female students from the 1870s onwards. Jessie Mothersole (1874-1958) was a 17-year-old from Colchester when she entered the Slade for the 1891-1892 session, remaining until 1896. Fig. 1 Proportion of men and women students at the Slade School during the 1892-1893 session. Jessie Mothersole’s artistic skill did not go unnoticed; she was awarded prizes (2nd class) in drawing from life and drawing from the antique in 1892. In 1893 she was awarded certificates in advanced antique drawing and figure drawing. These awards foreshadowed her career in illustration and writing. Winifred “Freda” Hansard (1872-1937) studied at the Royal Academy Schools before she entered the Slade for the 1895-1896 session, remaining until 1897. Her work was later included in the Royal Academy’s Summer Exhibition. In 1899 she exhibited Isola dei Pescatori in Lago Maggiore and Medusa Turning a Shepherd into Stone, which was described in Hearth and Home as “a vigorous, dramatic picture…”. Her painting Priscilla was displayed at the Royal Academy in 1900 and Rival Charms in 1901. In 1902 Freda re-entered UCL as a student in Egyptology under the leadership of Professor Flinders Petrie. 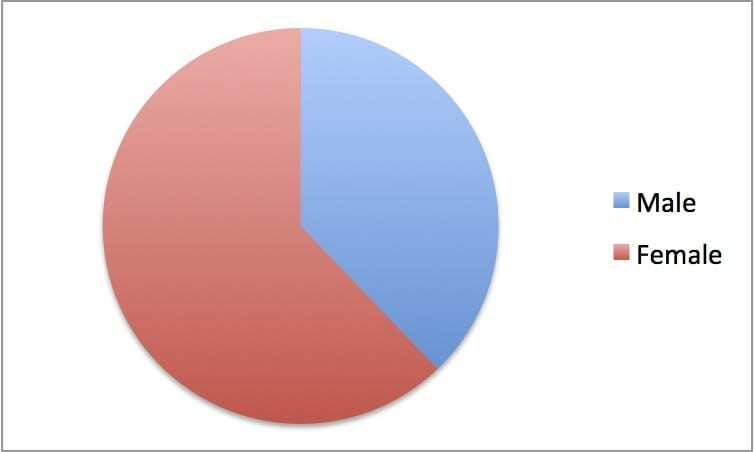 As in the Slade a decade earlier, in the 1902-1903 session, the number of women Egyptology students surpassed that of men. Fig. 2 Proportion of men and women students of Egyptology at UCL during the 1902-1903 session. At this point Petrie was making annual journeys to Egypt to excavate ancient sites. Egyptology students were offered the opportunity to take part in Petrie’s excavations, and in 1902 Freda Hansard joined eight other team members at Abydos, a town and pilgrimage site north of Luxor. There her artistic skills were harnessed to record the inscriptions and scenes on the walls of the Osirieon, a special building for the worship of the Egyptian god Osiris, ruler of the Underworld. The drawings she made with Egyptologist and UCL lecturer Margaret Murray, who directed the Osereion excavations with Petrie’s wife Hilda, were put on display at UCL alongside antiquities from Abydos in July 1903. Hansard returned to Egypt for the 1903/1904 season, joining Jessie Mothersole and Margaret Murray at the cemetery site of Saqqara – an hour’s train and then another hour’s donkey ride away from Cairo. Jessie Mothersole used her camera to capture the setting of this transnational phase in her artistic life. Her photographs show the Saqqara landscape, ancient remains, excavation scenes and the Egyptian team working with them. These images were later published in an article entitled “Tomb Copying in Egypt” for the popular magazine Sunday at Home. The publication included two uncredited line drawings, probably done by Jessie herself, depicting the hut in which she, Freda and Margaret Murray lived on site and the Egyptian boy who brought them water every day. 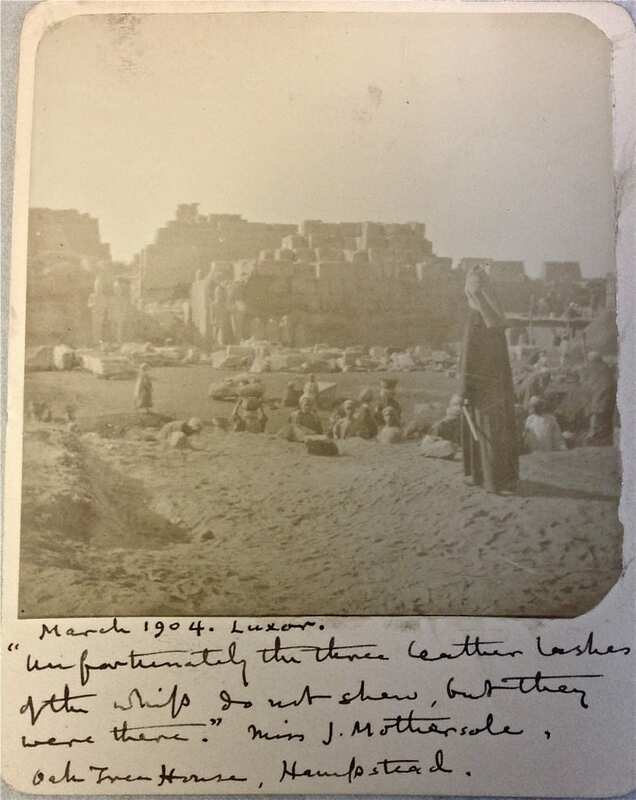 The Petrie Museum has one photograph in their archive credited to Jessie Mothersole, taken in Luxor rather than Saqqara (fig 3). But the hand-written caption underneath hints at her eye for minute detail that permeates her article. Fig. 3 This photograph is dated March, 1904. Its handwritten caption reads: “Unfortunately the three leather lashes of the whip do not show, but they were there.” Miss J. Mothersole, Oak Tree House, Hampstead. Courtesy of the Petrie Museum of Egyptology. Jessie remained largely based in the UK thereafter, moving into book illustration and writing on British archaeology. Freda returned to Egypt for further work at Saqqara, and married former solicitor turned Egyptologist Cecil Firth in 1906. The Firths were mainly based in Egypt, barring the period of the First World War, and Freda Firth continued to contribute to archaeological illustration after her marriage. Excerpts published from her daughter Diana Firth Woolner’s 1926 diary reveal something of the Firths’ life in Egypt and the Anglo-American-Egyptian network at work. One particularly interesting entry describes Freda and Diana’s visit with artist/archaeologist (and former UCL Egyptology student) Annie Pirie Quibell to see Egyptian bread being made. Freda Firth took advantage of the opportunities at UCL for intellectual expansion as a woman student and built a life for herself in Egypt. Her experiences there coloured the rest of her life as an artist, and give her a lasting transnational legacy. She and Jessie Mothersole were two of many women whose time at UCL affected the rest of their lives. I was happy to discover recently that this history is currently being explored through a new arts project – Kristina Clackson Bonnington’s The Girl at the Door. I think Jessie and Freda would approve. Bierbrier, M. 2012. FIRTH, Winifred (Freda) Nest (nee Hansard) (1872-1937). Who Was Who in Egyptology 4th Revised Edition. pp. 191. London: Egypt Exploration Society. Graves, A. 1905. The Royal Academy of Arts: A Complete Dictionary of Contributors and their work from its foundation in 1769 to 1904. Vol III. Eadie to Harraden. London: Henry Graves and Co. Ltd/George Bell & Sons. Harte, N. & North, J. 2004. The World of UCL 1828-2004. London: UCL Press. James, T. G. H. 1994. The Other Side of Archaeology: Saqqara in 1926. Egyptian Archaeology 5: 36-37. James, T. G. H. 1995. The Other Side of Archaeology: Saqqara in 1926 (II). Egyptian Archaeology 7: 35-37. Murray, M. 1903. The Osireion at Abydos. London: Bernard Quaritch. Murray, M. 1963. My First Hundred Years. London: William Kimber. Thornton, A. 2015. Exhibition Season: Annual Archaeological Exhibitions in London, 1880s-1930s. Bulletin of the History of Archaeology 25 (2): 1-18; Appendices 1 (pp. 1-5) and 2 (pp. 1-44). DOI: 10.5334/bha.252. 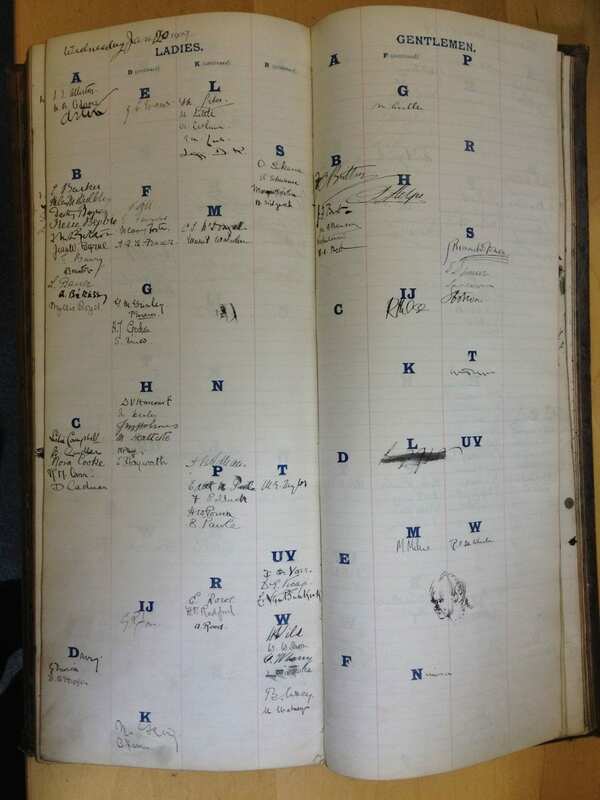 UCL Calendars for 1893, 1894 (UCL Records Office). UCL Session Fees Books, 1892-1893, 1902-1903 (UCL Records Office). With thanks to Alice Stevenson and Robert Winckworth. Two years ago the Slade hosted an event celebrating the work of filmmaker Lorenza Mazzetti as part of ongoing research into the history of the Slade Film Department. Organised by Brighid Lowe (Slade) and Margot Bannerman (University of the Arts, CSM) the event included rare screenings of her two London films ‘K’ (1954) and ‘Together’ (1956) and featured an extended discussion with Lorenza Mazzetti. We’ve now published excerpts from A Conversation with Lorenza Mazzetti, a film made by Gilly Booth and Dr Chris Horrocks of hijack film production as part of the 2013 event. It is an opportune moment to revisit Mazzetti’s vision. Excerpts from her seminal film Together (1956) will be screened at the Borderlines Film Festival at Hay-on-Wye this Saturday, 28th of February. The screening forms part of a programme exploring the legacy of Britain’s forgotten female filmmakers of the ‘40s and ‘50s, presented by film historian and broadcaster Ian Christie. Lorenza Mazzetti on Paolozzi – a filmed interview at UCL’s Slade School of Fine Art, March 2013 to accompany a screening of the Italian director’s 1956 film Together for the major retrospective Eduardo Paolozzi: Collaging Culture, at Pallant House Gallery, Chichester 2013, from hijack film production. As a student at the Slade School of Fine Art Lorenza Mazzetti made her first film K based on Kafka’s Metamorphosis, featuring fellow student Michael Andrews as Gregor Samsa. With support from the Slade Professor William Coldstream and the director of the BFI, Denis Forman, Mazzetti was financed by the BFI Experimental Film Fund to make Together, with Eduardo Paolozzi and Michael Andrews as deaf-mute dockworkers in London’s bomb-damaged East End. Together was shown at the first Free Cinema event at the NFT in 1956. With its credo of subjectivity, poetic freedom and the elevation of the everyday, Free Cinema brought Mazzetti into contact with figures such as Lindsay Anderson, Karel Reisz, Tony Richardson,Walter Lassally and John Fletcher. In its pronounced rejection of theatrical cinematic conventions, Free Cinema’s relationship with Italian neorealism, radical British documentary and ‘Kitchen Sink’ drama, situates it at a contested but fascinating point within post–war British culture. As an Italian woman in a predominantly male domain, working at the cusp of the profound social and cultural shifts later associated with the 1960’s, Mazzetti offers unique insights into the creative and intellectual ambitions of the Free Cinema Movement in Britain. Mazzetti returned to Italy in 1956 where she made documentary films and wrote two novels. Her 1961 novel Il Cielo Cade (The Sky Falls), based on her traumatic childhood wartime experiences, was made into the 2000 film directed by Andrea and Antonio Frazzi, starring Isabella Rossellini. She worked collaboratively for many years in puppet theatre and continues to paint prolifically. London Diaries – Mazzetti’s account of her time in England was recently published by Sellario in Italy. She lives and works in Rome. In the late 1950s, not long after graduating from the Slade, he set up the Curwen Studio with Robert Erskine. He continues to generously share his enthusiasm for printmaking, as demonstrated with his vision for the Curwen Print Study Centre which he co-founded with Sue Jones in 2000. The interview excerpts published on SoundCloud were taken from a recording conducted in 1992 by Stephen Chaplin (then archivist at the Slade), and digitized in 2013 as part of the Slade Oral History Project. In his interview Jones reflects on the changing practices and personalities of printmaking at the Slade and beyond. Today we launch our new online resource which brings to life some of the most requested items from the archive – the Slade class photos. The Slade has a fascinating, but currently incomplete, collection of annual class photographs dating from 1931. The black and white panoramic images reflect the school’s rich history, capturing the likeness of Slade students and faculty through the decades. We’re asking former staff and students, scholars and members of the public to help us complete the collection and identify the sitters through a new website designed by UCL Centre for Digital Humanities. 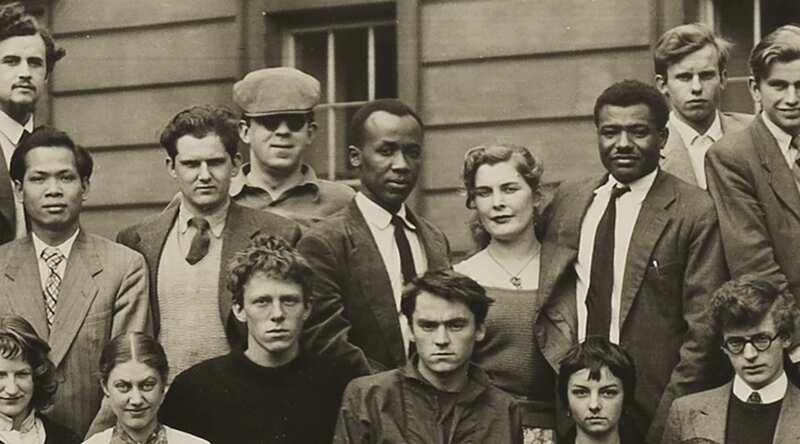 We’ve already listed all of those who appear in this photograph from 1953, including William Coldstream, Lucien Freud, Henry Moore, Sam Ntiro, and Paula Rego. Can you help us identify other faces captured through the years? The feedback provided by visitors to the site will result in a dynamic archive and research resource, giving us an opportunity to compare crowdsourcing platforms and begin to trace the impact of Slade alumni around the world. This project is a collaboration between UCL Centre for Digital Humanities and the Slade School of Fine Art, as part of the Slade Archive Project. Thanks to funding from the Andor Charitable Trust we have been able to digitize a rich collection of oral history interviews made by Stephen Chaplin in the 1990s as part of his research on the history of the Slade. The recordings include conversations with Bernard Cohen, Stanley Jones, Olga Lehmann and Barto dos Santos, along with other former Slade staff and students. Chaplin aimed to interview a cross-section of people – not only the most prominent and senior figures. Even William Coldstream’s secretary, Margaret Bennett, was interviewed. Our three project interns, Patrick Sykes, Neelam Choudhry and Sadie Hough, have produced summaries of the recordings and selected excerpts for streaming on the Slade Archive Project SoundCloud profile. The first in a series of highlights from this collection is an interview with Slade alumna and renowned artist, illustrator and theatre designer, Olga Lehmann (1912-2001). Lehmann studied at the Slade in the early 1930s under the tutelage of Henry Tonks and Randolph Schwabe, and specialised in theatrical design under Vladimir Polunin. She quickly acquired a reputation for her work as a muralist, portrait painter and costume designer and her illustrations were regularly featured in Radio Times. Lehmann’s oral history recording with Stephen Chaplin was conducted in 1992. She provides a lively account of her time at the Slade, reflects on the bohemian world of Fitzrovia, on being a young female artist prior to the outbreak of the Second World War, and on studying and socialising with some of the notable figures of her era. She speaks candidly about their words of advice, the dynamics between the tutors and students, the daily rituals at the school – and of the privilege of being admitted to the life drawing room. In the weeks to come we’ll be featuring more of these highlights from this Slade oral history collection. Stay tuned! From 1990-97, scholar and former Slade student Stephen Chaplin undertook an ambitious project to rescue the Slade archives. Chaplin began to catalogue and re-house the collection of documents, photographs and objects, which up to that point had been dispersed in unsorted boxes in back corners of offices, studio spaces and family archives. On the advice of Jean Spencer, then Tutor to the Students & Slade Secretary, he also set out to ‘computerise’ these archive records – though the limitations of the early electronic catalogue systems would prove to cause as many challenges as solutions. As a retired art historian and Slade alumnus (1952-55), Chaplin also used oral history as a way of capturing the everyday experiences of those at the Slade. 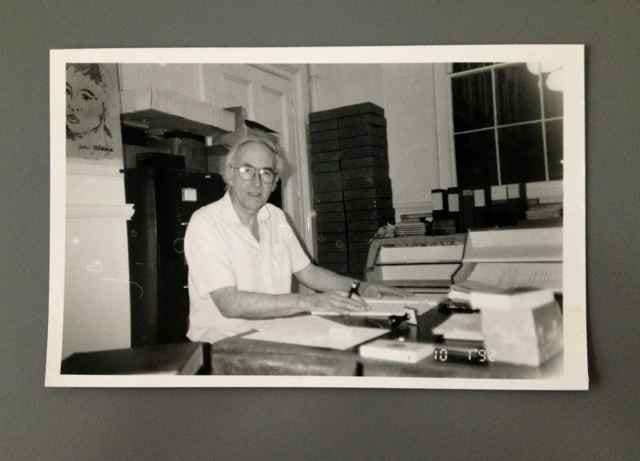 He conducted audio interviews and sought contributions to the archive from alumni and their families in the form of letters, memoirs, photographs and other documentation. He faithfully answered scholars’ research queries and noted and logged the who, what, where and when of as much Slade history as he could gather. During these years, he kept a personal diary to document his observations of ‘the daily life of the school as seen though the marginal vision of an archivist’. With funding from the Leverhulme Trust and ongoing support from UCL Library and UCL Art Museum (then known as the Strang Print Room), Chaplin’s work provided an invaluable foundation on which to build a framework for the Slade’s growing archive. But technological challenges and finite resources limited his ambitions. The computer system crashed at a key moment and some of the index was lost. It was too early for the internet to be of much help in drawing the networks of connections between living and written history, and the mass of information gathered could not be encompassed in publishable form without significant editorial support. Chaplin’s contribution rests in large part as an unpublished manuscript and archive index that he called ‘the Slade Archive Reader’, now housed in UCL Special Collections [MS ADD 400]. The document provides an invaluable overview of the archive, functioning as both a finding aid and a summary of the first century of the school’s history. Archive research is full of fascinating twists and turns. By their nature archives are subject to periods of neglect and changing collection practices so they can be a maze of false leads and missing links. Archives are also subject to well-intended but inaccurate interpretation. This excerpt tells an entirely different (and indeed more layered) story of the casting of Tonks’s death mask than the one described in an earlier blog post. It was in fact Alfred Gerrard and Thomas Monnington who made the mask, not William Coldstream. Let the record hereby stand corrected. ed. Andrew Forge, Tate Gallery Publications, London, 1976, p.72. Salah M. Hassan, Ibrahim El-Salahi: A Visionary Modernist p. 12. Pioneering artist and Slade alumnus Ibrahim El-Salahi is the subject of a groundbreaking exhibition that marks the first time Tate Modern has given a retrospective to an African artist. As a young Sudanese artist and teacher, El-Salahi was sponsored by the Sudanese Government to study at the Slade from 1954-57. Already an accomplished artist (having obtained a Diploma from Gordon Memorial College, and been appointed drawing master in the Department of Art), El-Salahi’s period at the Slade expanded his awareness of modernism and western art history. But when he returned to Sudan at the end of his studies, he encountered local indifference to the work he’d produced in London. It was a reaction that would prompt the burgeoning artist to venture into altogether new artistic territory. He began to fuse aspects of European art movements with elements of Islamic, Arabic and African art in a revolutionary re-imagining of the various artistic traditions around him. Through this cross-pollination El-Salahi become a pioneering figure in African Modernism; not only as an artist, but through his work as an activist, writer, diplomat and even as a presenter on a national television programme. El-Salahi (centre) and fellow students at the Slade, 1956. While a student at the Slade, El-Salahi won the Slade Prize ‘for the illumination of lettering’, a fitting award considering Arabic calligraphy would become a key source for much of his later work. Ibrahim El-Salahi: A Visionary Modernist is at Tate Modern until 22 September 2013. Both El-Salahi and his co-exhibitor at Tate Modern, Meschac Gaba, are the subject of a recent episode of The Culture Show on BBC 2, and the exhibition’s curator, Salah M. Hassan, discusses El-Salahi’s work on BBC Radio 3’s Night Waves.